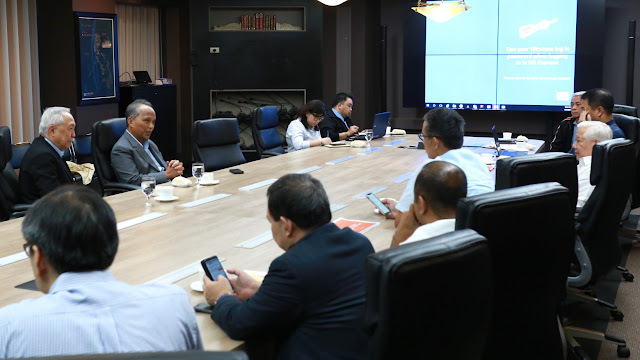 Energy Secretary Alfonso G. Cusi met with Manila Electric Company (MERALCO) officials headed by Meralco President and CEO Oscar S. Reyes yesterday (3 April) to discuss the details of the delivery of power to its customers throughout the summer months. Department of Energy (DOE) Secretary Alfonso G. Cusi has been closely coordinating with the power industry players to address the growing demand and the thinning of power reserves for the summer months. “The entire energy family should take a pro-active approach towards securing our power supply, especially since it is both summer and election season,” Sec. Cusi said. The National Grid Corporation of the Philippines (NGCP), Independent Electricity Market Operator of the Philippines, Manila Electric Company (Meralco), and the DOE agreed that the power situation should be closely monitored given supply level adjustments brought about by increasing demand and the forced outages of power plants. Strategies on how to address thinning power reserves were also discussed during a meeting with Meralco officials. This includes the creation of additional power bypass lines, the efficient utilization of available power plants, as well as the application of demand-side management and accurate information dissemination to consumers. On the matter of the Interruptible Load Program (ILP) as a measure to help enhance power reserves, Sec. Cusi emphasized that “it shall be implemented as a last resort given the additional costs the ILP would bring to consumers.” The ILP serves as an option for Distribution Utilities (DUs) like MERALCO and electric cooperatives to ask their big load customers to serve their own power needs by using their own generator sets to augment power supply capacity in times of Red Alert Status or when power supply reserves are thin. “We will not wait for a loss of power to occur. The ILP is there as a final option to help us prevent a supply shortage,” Sec. Cusi added. According to the report of the NGCP, the yellow alert status issued today has been lifted effective at 4:00pm due to sufficient operating reserve brought about by low actual demand. “The DOE and the energy players are closely monitoring the increases in demand and the power plants that are expected to be in,” Undersecretary Felix William B. Fuentebella emphasized in a press conference earlier at the agency’s headquarters. The other strategies considered by the power industry players include the management of plant maintenance schedules, the optimization of existing hydroelectric power plants, the upgrading of the electricity facilities, the preparation of available generator sets for unforeseen outages, the participation of big establishments in the Interruptible Load Program, as well as the continued call for an energy efficiency lifestyle for electricity end-users. The DOE also emphasized the improvement of the operations of power plants and through the use of renewable energy (RE) and information technology. The DOE through its Energy Utilization Management Bureau (EUMB) reiterated the importance of its SAVE SAVE SAVE energy efficiency campaign, not only to incur more savings, but also to ensure uninterrupted electricity services this summer season.